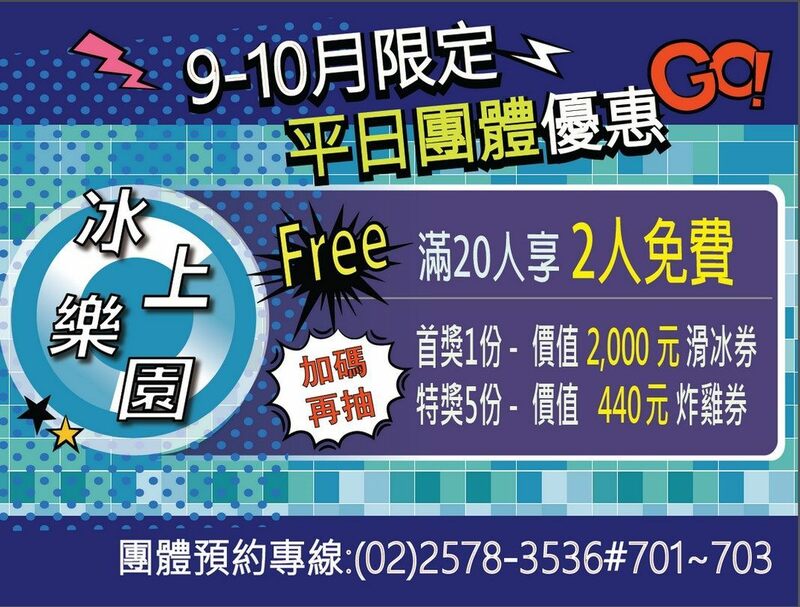 From September 1st through October 31st, the Taipei Arena ice skating rink will offer discounts for customers in groups of twenty or more. For groups as such, two will receive free admission. Another highlight of promotional deal is that one lottery ticket is distributed per group of 20 visitors. The larger the group, the more raffle tickets you receive, hence the higher the chance to win. Receipts from paid entry tickets are redeemable within the same day for a free chicken wing when two orders are made for a full fried chicken meal at Cheogajip. Since August, skates and other associated equipment have been upgraded in an effort to improve customers’ ice-skating experience. In order to transform the venue into a family friendly one, zones inside the building has been designated for parking baby strollers as well. As a forerunner among other equivalent enterprises, the Taipei Arena leads the good intention in consideration of customers visiting with their families, and reserves adequate space for parking up to 12 baby strollers on the venue’s second floor hallway. Instructions are available via digital guides, as well as by staff members on duty, to help parents accurately locate and retrieve their strollers when needed. Benefiting from the overall technology upgrade, families can enjoy their experience at the facility without constantly having to check on their itinerary or worrying about the inconvenience of bringing strollers. Further information can be found by calling the 24-hr customer service line of TRTC at (02) 218-12345, or via the 1999 Citizens Hotline. More details can be obtained through the Taipei Arena’s Chinese website at (http://www.arena.taipei/), or (https://www.metro.taipei/).